Every once in a while, I get to review an action figure based on their current look in the comic book. Not very often, but sometimes. These are one of those times. 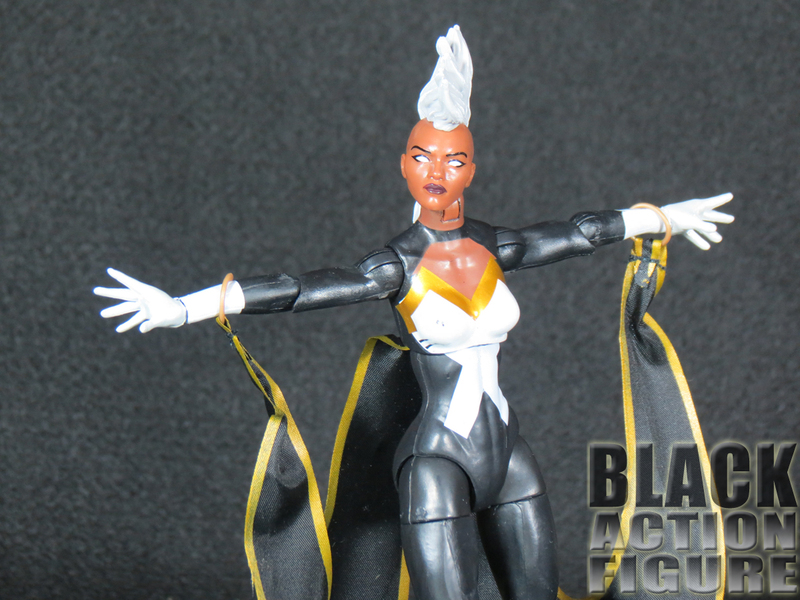 Next up is the long-awaited Marvel Legends Infinite Series Storm based from her Marvel Now! costume and look. 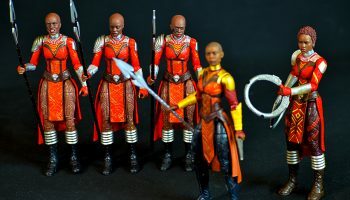 I know the last time I reviewed a Storm figure it was the classic Storm from the Marvel Select line and I may have reviewed the 3.75″ Storm from the Marvel Universe line, but to me, the 6″ Marvel Legends line is the sweet spot. This Marvel Legends Storm figure is packaged in one of the newer, more collectible, Marvel Legends Infinite side opening package. Meaning that you can open, enjoy it, and pack it back in with little to no signs of it being disturbed. This of course is great for collectors and general enthusiast alike. The front has a nice and stylish black and blue layout with a prominent picture window. Nothing new and nothing flashy. Here’s the nicely packed action figure, take it or leave it. The back continues the stylish simplicity of the front. A nice action shot of the figure is joined with a bio-blurb of the character. 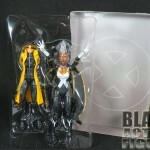 Then the lower quarter of the box displays the rest of the line along with the Jubilee Build-A-Figure. 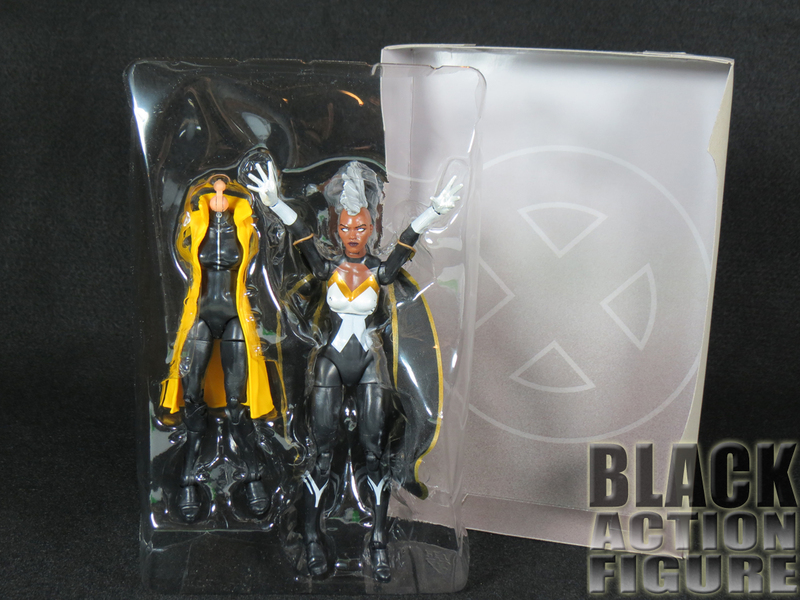 When you take the figure out of the packaging, it is a little disconcerting seeing this headless, armless figure next to Storm. The mature ones among us will take the proper meaning from that. I will not tell you what the immature take from it. I also like the “X” background of the card backing, but you really don’t notice it too well until you take the figure out of the packaging. I think I’ve said it before, but it may bear some repeating…Build-A-Figure pieces do not count as accessories. I mean, don’t get me wrong, I love getting a Build-A-Figure…but that piece should come after whatever figure and suitable accessories should come with it. 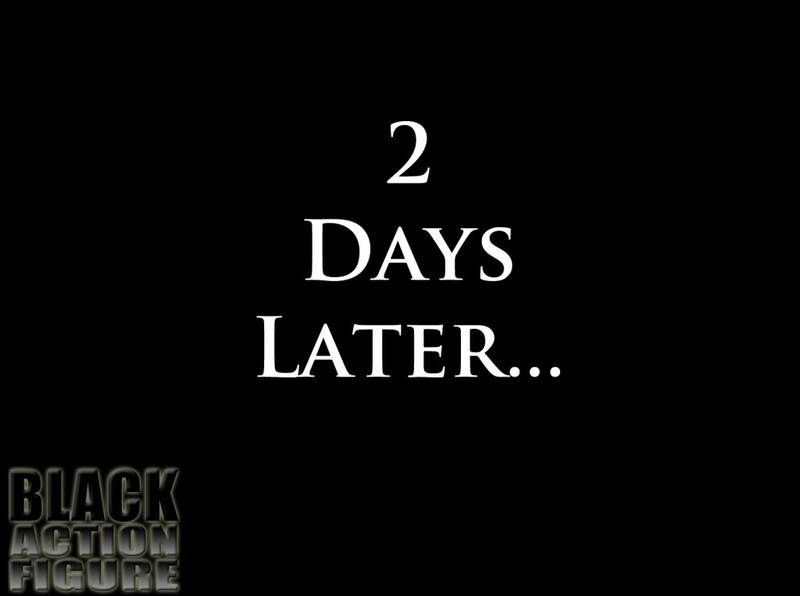 In the case of Storm, we get…wait for it…nothing. I really love the fact that I’m getting an updated Storm. 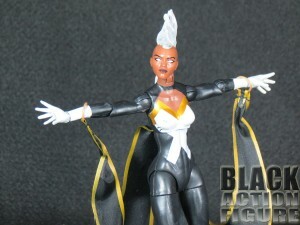 And not only does this action figure look great, it is a page right out of the X-Men comic books. 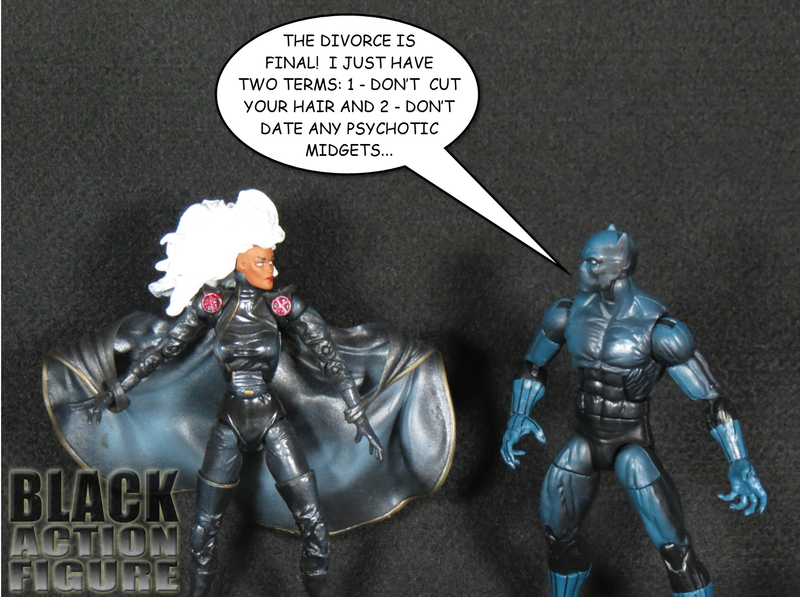 Storm gets her divorce from the Black Panther and the first thing she does is join Wolverine’s group of X-Men, get a new costume, and cut her hair back to the punk mohawk that she rocked in the eighties. Love it. 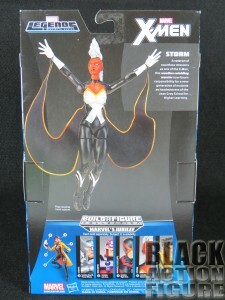 This time around, they gave the Storm action figure a malleable cape. 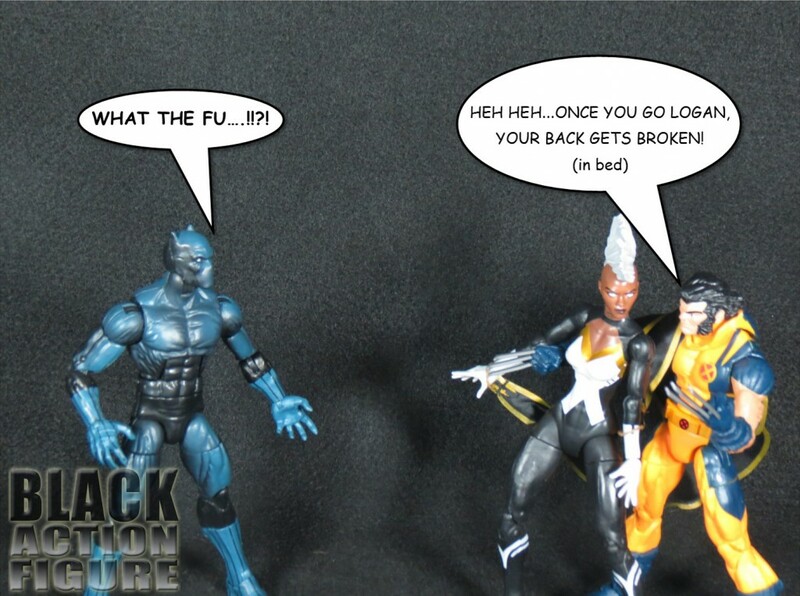 The Marvel Universe figures never seem to get it right. The old Marvel Legend Storm figure has a awkward, rubber cape. 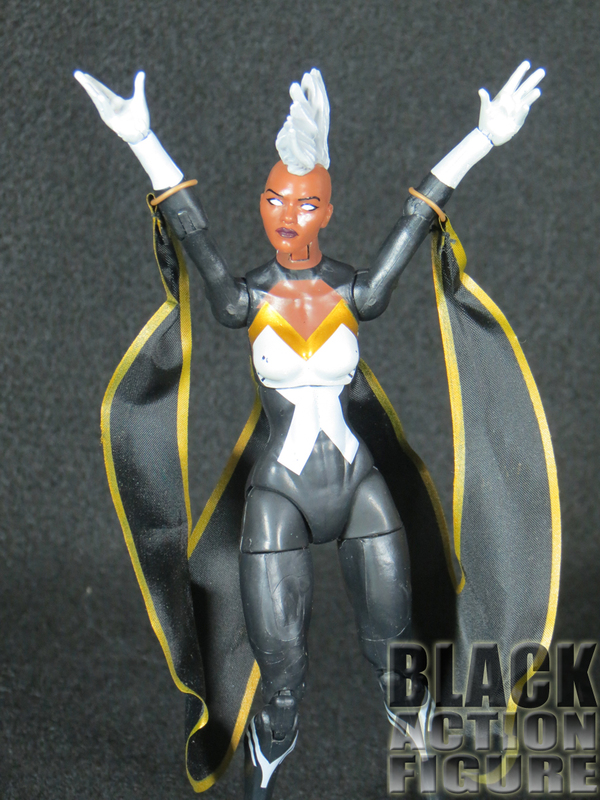 Finally we get a Storm who we’re able to move her arms freely and pose how we want. 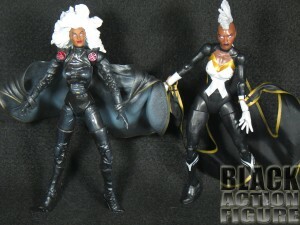 I did a side-by-side comparison of the old Storm Marvel Legends figure (one that I was able to pick up off of eBay loose) with this new one, and for once, it is a very close match. The ToyBiz Storm looks almost exactly like the new Hasbro Storm…with the exception that Hasbro has been doing larger head sizes. For some reason, I feel pretty good that they are that close a match. Makes me think that Toy Biz was doing something pretty good and was doing it years ago before Marvel Legends became big again. If I have any complaints it would be about the sloppy paint apps. Because this figure has not been made widely available, it’s disheartening to get a figure blindly sent to you only to find that new out of the box there are two very noticeable areas of missing or chipped paint. Coincidentally, both of those spots are on the…breastial part of the costume (yes I made the word “breastial” up). I feel I have to say that I’m not a perv (well, yes I am but not for action figures) but it is hard to enjoy the figure with such glaring paint errors. 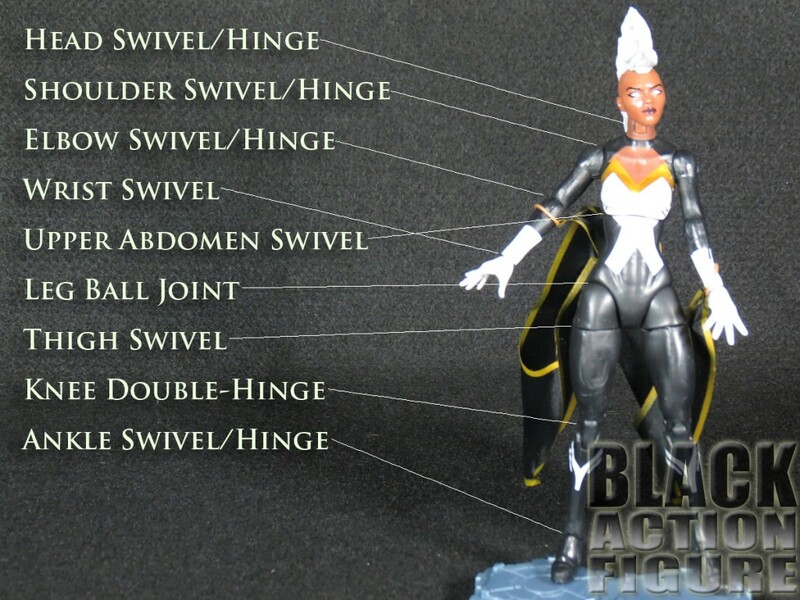 A lot of updated articulation from the original Storm Marvel Legend. Over 25 points of articulation. What makes the head/neck articulation nice is that by moving the hair to the side, you can get the figure’s head to look all the way up, making for some nice posing. The hair is still an articulation issue, but it does not completely block it like the Toy Biz Legends figure. 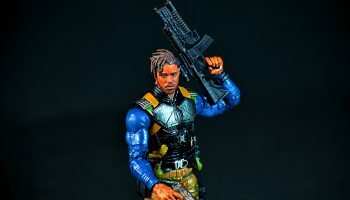 Looking at the Toy Biz Storm, it may actually have more points of articulation, but it is something about this new Hasbro Storm figure that makes me not care. There’s a more natural feel to the articulation and flows nicely. I love that they are getting more and more Marvel Legends out there, especially X-Men characters. 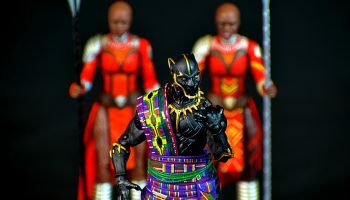 What’s not so nice is how difficult it is for collectors to get their hands on these figures. This was a shared exclusive between Toys R Us and Diamond Distribution. Diamond told their retailers (mostly online) that they were cutting their original shipment orders by over 50%, so it is very plausible that someone may not be able to get their hands on them. 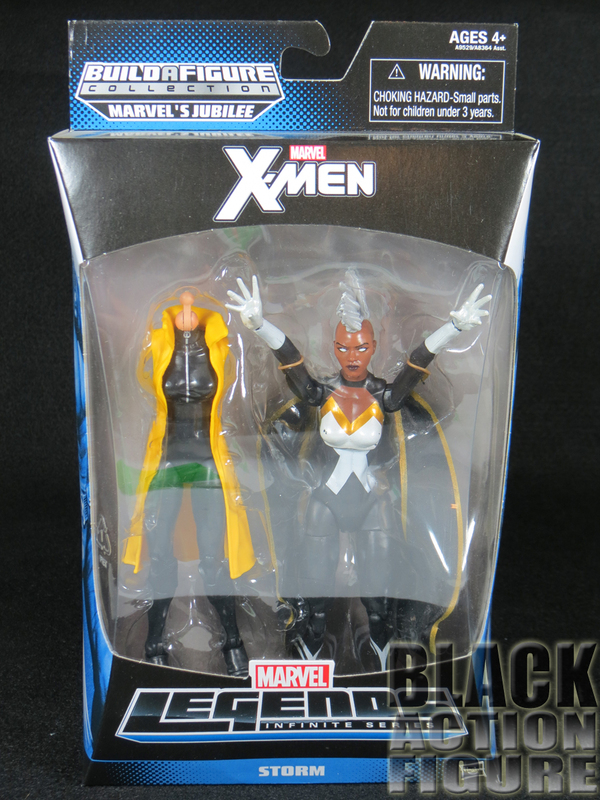 So now they have to stalk a Toys R Us hoping against all hope that they will be the one to get the one Storm or one Magneto in the case of 8. Distribution really doesn’t make sense. If you come across this figure and if you’re either a serious collector or a small enthusiast, please pick one up. If not for yourself, pick one up for your friend who collects but has to work everyday including weekends and is unable to get one themselves. It is definitely worth the trouble.